The /TEC is a ST manufactured printed circuit assembly for use in terminating all field wiring to the signatureACE sa2000 controller. A good balance exists between small packaging and high point count considering that most applications utilize less than 25% of the available points. All I/O utilizes industry standard OPTO22 style interface modules which include an LED for each point and fuse protection on each output. See /TEB if you want a NEMA 4 enclosed version. Board thickness twice that of most similar products in order to provide no flexure under high loads at center points. 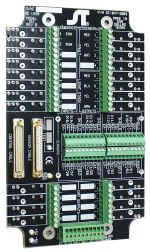 High quality terminals designed for large wiring on control circuits. High quality terminals designed for easy angled access for signal wiring. Built in fuse tester for all fuse types used by different module vendors. LED indication of ±5 power, auto-zero pulse, and fuse test. User definable I/O has writing surface tags. 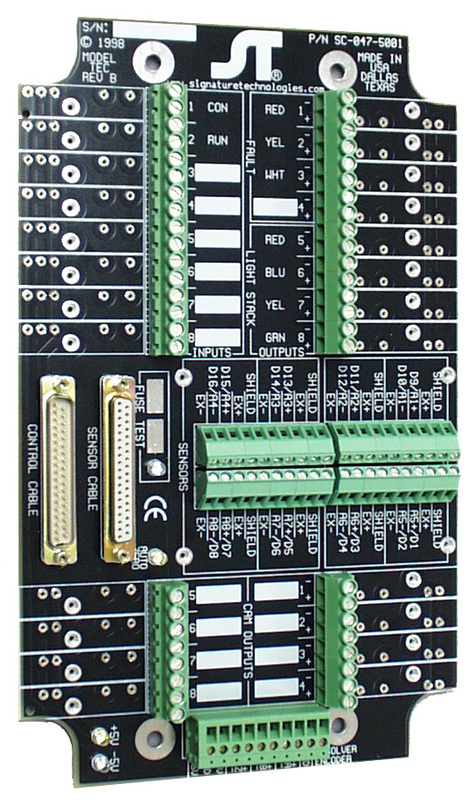 Price includes 3 OPTO22 outputs and 1 OPTO22 input module. Expansion to 8 inputs, 8 outputs and 8 output CAMS (programmable limit switch points) is done through software and adding modules. Module voltages can be mixed if required. Same analog terminals can be used for die-protection, analog signals, and/or strain gauges. Strain gauge source power provided. Normally connected to SA2000 using /T04 four foot termination cable. Longer lengths available. Customer must specify required voltages for OPTO22 modules at time of order or the 120VAC units will be shipped as the default. Consult with ST prior to using OPTO 22 for Die-protection applications to insure adequate speed of outputs...higher speed outputs are available. Customer must install with minimum 0.25" space and use supplied insulation backing board between TEC and enclosure mounting surface to prevent shorts. Use of isolation mounts required for press mounted applications. Available as option. Click on image to enlarge for detailed view!